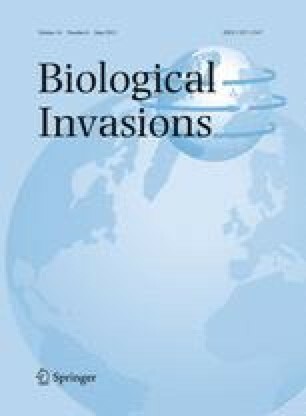 Empirical support for ‘invasional meltdown’, where the presence of one invading species facilitates another and compounds negative impacts on indigenous species, is equivocal with few convincing studies. In Ireland, the bank vole was introduced 80 years ago and now occupies a third of the island. The greater white-toothed shrew arrived more recently within the invasive range of the bank vole. We surveyed the abundance of both invasive species and two indigenous species, the wood mouse and pygmy shrew, throughout their respective ranges. The negative effects of invasive on indigenous species were strong and cumulative bringing about species replacement. The greater white-toothed shrew, the second invader, had a positive and synergistic effect on the abundance of the bank vole, the first invader, but a negative and compounding effect on the abundance of the wood mouse and occurrence of the pygmy shrew. The gradual replacement of the wood mouse by the bank vole decreased with distance from the point of the bank vole’s introduction whilst no pygmy shrews were captured where both invasive species were present. Such interactions may not be unique to invasions but characteristic of all multispecies communities. Small mammals are central in terrestrial food webs and compositional changes to this community in Ireland are likely to reverberate throughout the ecosystem. Vegetation composition and structure, invertebrate communities and the productivity of avian and mammalian predators are likely to be affected. Control of these invasive species may only be effected through landscape and habitat management. Dr. Neil Reid was supported by the Natural Heritage Research Partnership (NHRP) between the Northern Ireland Environment Agency (NIEA) and Quercus, Queen’s University Belfast (QUB). Dr. Mathieu Lundy was supported by The National Parks and Wildlife Service, Department of Arts, Heritage and the Gaeltacht (Republic of Ireland). Licences to trap pygmy shrews (a protected species) were issued by the National Parks and Wildlife Service, Department of Arts, Heritage and the Gaeltacht (Republic of Ireland) and the Northern Ireland Environment Agency, Department of Environment (United Kingdom). We are grateful to Dr. Sally Montgomery who provided invaluable assistance in the field, whilst thanks also go to the farmers and landowners of Ireland for their goodwill, interest and hospitality. We are also grateful to Derek Yalden for comments on an early draft of the manuscript and to two anonymous referees for their contributions in improving the final publication.